As I was creating an account for date.com, I am immediately prompted to enter details about myself. I was particularly shocked that I had to enter my EXACT WEIGHT! I wonder how many people will actually enter this. As I am entering my education background, I am prompted to enter the college I attended. Much more detail than other sites I have observed. There is also a check box next to what other language you speak other than English. It assumes you speak English already. At the very bottom of the first page, it gives you the option to write a detailed description for yourself. Lastly, I am prompted to upload a picture again with tips on “Photo Do’s and Don’ts”. After agreeing to their terms, they refer me to their sister, latino dating site which I kindly skip. I am then already viewing my profile page. Total time to register less than 10 min. There is also a counter at the top right to review how many people registered this week, new members near you, people currently on IM, number of profiles you have viewed, number of people who have viewed you, and finally gifts sent and received. At the bottom of your profile is the search box. After doing a quick search, I find that most of the profile have pictures. Once you create a profile, apparently, there are more things to fill out to ‘complete’ your profile. You can add details to your interests and what you look for in a partner. Registration was very easy and quick. I was able to navigate through the pages and search without any problems. The whole website looks like a turbo charged email in box. 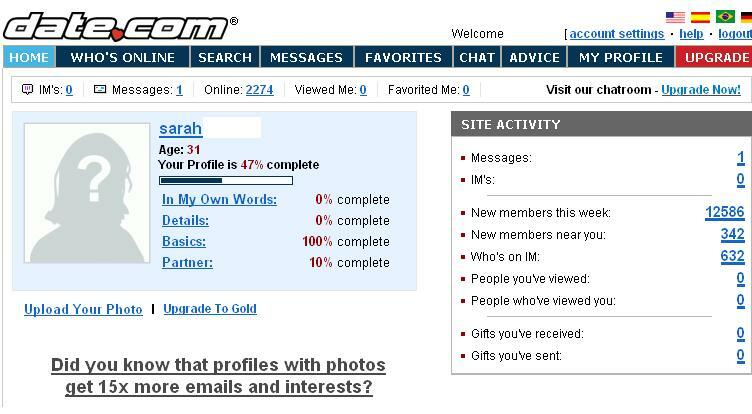 What attracted to me was that you can see profiles of members who are currently online. Once you click on the ‘send message’ button, it prompts you to join as a paid member. If you don’t want the mumbo jumbo compatibility tests and are willing to gamble on your own instinct on finding someone based on their picture / profile, this is a good site to consider.